You may not know the name Dennis Sym. But if you attended Miami Dolphins games from 1966 to 2000, you saw him at every home game. 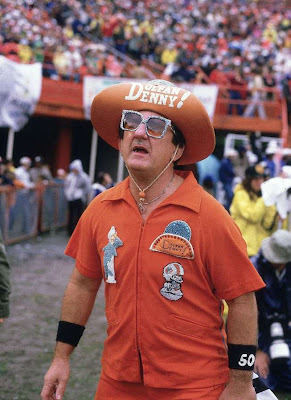 Dressed in his loud orange outfits complete with rhinestones, Sym was more famously known as Dolfan Denny, the team's unofficial mascot. For 34 years, he led the cheers at Dolphins games. In the beginning, he was just another exuberant spectator in the Orange Bowl stands. But week after week he became instantly recognized for his strange and flashy outfits. Even Dolphins owner Joe Robbie began to notice. During the first ten years of the Dolphins franchise, Sym became more popular every year. He was impossible to ignore. Robbie was impressed with Sym's passion and spirt for the Dolphins. In the 1970s he allowed Sym to cheer on the field from the sidelines. He was paid $50 a game and was forever known as Dolfan Denny. His favorite year was the Dolphins 1972 perfect season. "I think that was the most exciting year he ever had, " said his wife Ingrid. "The fans were all very active and all that changed after they moved into the new stadium. That was his very best year." In March 2007, Dennis Sym passed away from heart failure after battling kidney disease and cancer. He was 72 years old. Over the years Syms wore 10 sets of outfits to Dolphins games. His wacky gear included a puffy cowboy hat and a matador cape. He studied electrical engineering at the University of Tennessee and was a longtime Broward resident. Chronic health problems began to effect him in his later years as Dofan Denny. But even illness couldn't stop from him from cheering for his Dolphins. At one point his knees were so bad, he could be seen cheering from a chair. He retired in Sarasota, but his love for the Dolphins never went away. Great stuff! You really captured one of the characters of the OB. Do you have an editor proof/edit your work? Did Denny really have "hear failure"? 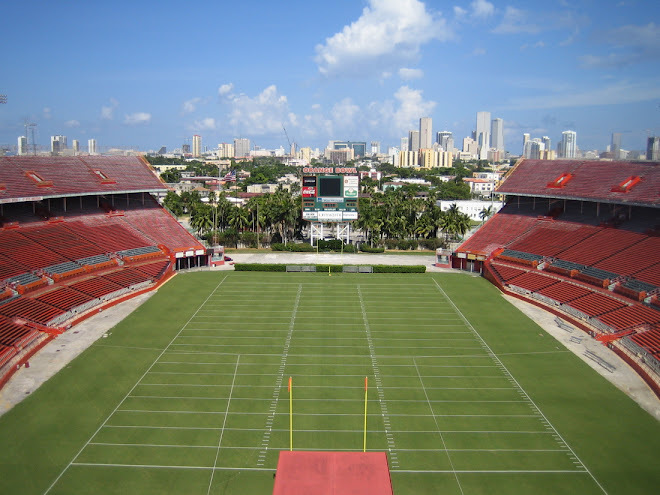 Is it okay to post this picture on Wikipedia's page Dolfan Denny?